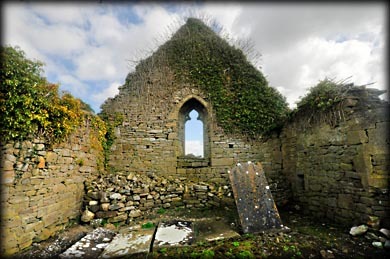 The picturesque ruins of Kilmanman church are situated inside an oval shaped graveyard. 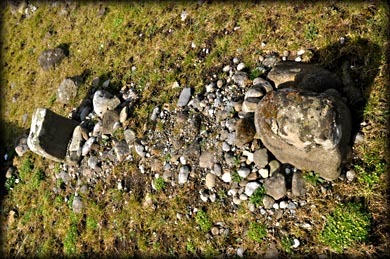 Locally is is believed to be the site of an early monastery, founded in the 7th century by St Manman. 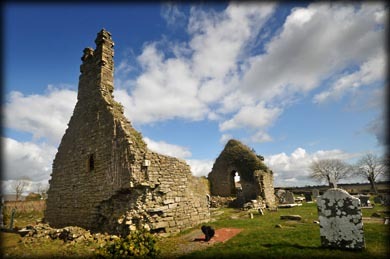 It is believed he also founded a monastery at Clonaslee. The undivided nave and chancel church is 20metres long by 10 metres wide. Most of the south wall is missing and the north wall is featureless. The first thing you notice as you approach the church are the remains of the bellcote on the west gable. The remains of a tracery window can be seen in the east gable, pictured right. 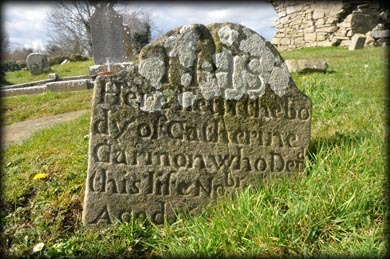 There is an interesting selection of inscribed 18th and 19th century headstones, as well as some plain grave markers. Situated: From Clonaslee head west on the R422 for 1.3 kilometres and turn right. After about 500 metres take the right at the fork. The church is another 500 metres down here on your left. Discovery Map 54: N 3040 1238. Last visit Mar 2018.